Last night’s rainfall was the equivalent of the perfect snowfall on a ski vacation. It began at 9 PM and ended at 6 AM. No thunder. No lightning. No wind. Just a steady all-night shower. The sky is already brightening by 9 AM. The forecast calls for a sunny afternoon. We interpret this as an invitation to another day of hiking at Acadia. We are becoming proficient in using the local transit system. 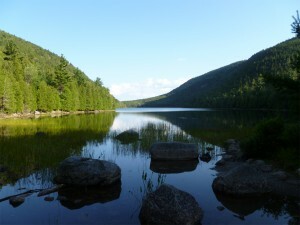 We take the bus to Bar Harbor, then transfer to another bus that takes us to the Blackwoods camping area at Otter Cove. Today we ascend Cadillac Mountain along the South Ridge Trail from Otter Cove. The ascent is gradual and scenic, but on the long side at 5 miles. Approaching the summit, we immediately understand why we saw only five people on yesterday’s hike. It’s because everyone in the park is hanging out at the summit of Cadillac Mountain. Cars, busses, campers, people and their pets have descended on this place in hordes. Perhaps all of this attention is justified. At 1530 feet, Cadillac is the highest point on the Atlantic coast. Allegedly, sunrise from this location is visible earlier than any other place in the nation. We will take the Park Ranger’s word on this. Although the view is magnificent, we organize a hasty departure from the summit to escape the crowd. Our descent is by way of the West Face Trail. The term “trail” is misleading as there is no path, per se. It is a steep descent over granite outcroppings and boulders through which the snow melt finds its way by gravity to Bubble Pond in the spring. Many of the rocks are still moist from last night’s rainfall and their surfaces are slippery. The pace is slow, but we rise to the challenge and complete the overall hike in four hours, including a stop for a backpack lunch along the way. We walk alongside Bubble Pond, pleased to have completed this hike. At the Park Loop Road, we are met by our new friends at the trusty public transit service that whisk us efficiently to Northeast Harbor. We are tired, dirty, sweaty and hungry. Sleep will come easily tonight.